The month before the ambulances arrived, women gave birth on the side of the road on their way to the clinic. 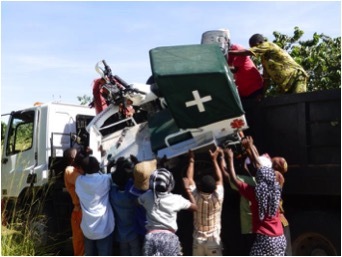 Our sister charity, Nema, worked tirelessly to fundraise, purchase and import two motorbike ambulances. Now the ambulances are busy collecting and delivering patients to the local clinic and maternity ward and, just within the last couple of months, have potentially already saved several lives. However, we urgently need your help. Importing the ambulances cost far more than we anticipated and we are now short of funds to run and operate the ambulances. A very real and tangible benefit you will be bringing to your hosts. Your $5 will support an ambulance for a minimum of 2 journeys that day, this will contribute to lowering of drastically high infant and maternal mortality rates and allow accidents and emergencies to be dealt with in an appropriate and timely manner. Everyone deserves the best health care we can give them. If you would like to contribute to this project, please do let us know and we will add this to your invoice. Your help could change the life of many. Thank you!